Indigo Shire’s outstanding citizens will be recognised at Australia Day Awards ceremonies across the region on Saturday 26 January. Indigo Shire Mayor Bernard Gaffney said Australia Day is the day we recognise some of the unsung heroes of the Indigo Shire community. “All of the award recipients are passionate community members and organisations, committed to serving others in their own unique way. It is their community spirit that makes Indigo Shire a great place to live,” said Cr Gaffney. A full list of award recipients is included below. Having lived in Rutherglen for over 50 years, Mary’s community involvement spans more than a dozen organisations, including Rutherglen Primary and High School, Rutherglen Hockey Club, Rutherglen & District Garden Club and Meals on Wheels. Amongst a long list of valuable contributions to these organisations, Mary played an integral role in developing the annual Rutherglen & District Garden Club Flower Show, bringing regional gardeners together and highlighting Rutherglen on the map for visitors to the region. Mary has been awarded life membership in a number of these organisations as a result of her continued passion and efforts. Val is the first contact for all bookings and enquiries at the Tangambalanga Community Centre. She is on duty 24/7; often sets up and packs up for functions, cleans floors and toilets, organizes maintenance, liaises with Council and synchronises the many hirers of the facility. With over 40 years of service, Val continues to be a valued and proactive member of the Coulston Park Committee of Management that manages the recreation park. Val also makes time to drive the local community car. Jan Morey has a long history of volunteering in the local community, including ten years as group leader of the Beechworth Nursing Mums Association, coaching swimming, coaching the girls and women’s local soccer teams, and volunteering as a member for a number of local committees. Jan has also dedicated over 700 hours to supporting young learner drivers through the Vic Roads Indigo Shire L2P Program. Eileen is a passionate and committed ambassador for the Chiltern‐Mt Pilot National Park and has become renowned both nationally and internationally for her knowledge of the human history, flora and fauna of the park. Eileen has been the driving force behind the establishment of the Friends of Chiltern‐Mt Pilot National Park group, building it to be a diverse and productive group of people committed to making the park a better place for everyone. The Kiewa Fire Brigade is considered an outstanding community organisation. Not only does it perform the expected tasks of putting out fires and keeping the community safe, but it is an integral and well respected part of the community. The Fire Brigade is always willing to assist, whether through its promotion of youth and community events such as Carols by Candlelight or its efforts in collecting for the Royal Children’s Hospital Appeal. The organisation’s wholehearted involvement in the Kiewa community adds to the liveability of the town. Callista is a 15‐year‐old running and athletics champion from Beechworth. Callista loves distance running and competes in various track and cross country events at regional, state and national levels. Her main events are 2,000m steeplechase, 3,000 metres track running, and 3‐4km cross country. In April Callista will be competing in the Australian Track & Field Championships in Sydney, before she takes on the Australian Junior Cross‐Country Championships in Adelaide in August. Heavy rainfall over the North East area the on 13th December 2018 has created issues with flash flooding/ overland flooding (150+mm). The main water has receded along the Hume Freeway, which is now open to traffic both ways. However, safety inspections, clearing works, and Rapid Impact Assessments are still being completed. The Wangaratta – Beechworth Road is closed, due to the Golden Ball Bridge receiving significant damage. Regional Roads Victoria is continuing to investigate and assess the damage. RRV is looking at temporary options to span the damage bridge. Beechworth community can access Wangaratta via the Chiltern Road to the Hume Freeway. The Buckland Gap Road is not suitable for heavy vehicles. Police will be monitoring roads and driver behaviour. Road conditions can change dramatically in a short period of time and Police ask all road users to take due care and attention. The Hume Highway is now open to all traffic both ways. Beechworth’s Historic Precinct could soon join historical sites like Mawson’s Hut and Bonegilla Migrant Camp on the National Heritage List, with Indigo Shire Council voting last night to submit a nomination for National Heritage listing. Indigo Shire Mayor Bernard Gaffney said a National Heritage listing would further cement the important place the Beechworth Historic Precinct holds in Indigo Shire’s history. “Our Historic Precinct is one of the best preserved examples of a Frontier Government District in Australia. It is of significant historic, social and economic importance to Indigo Shire,” he said. 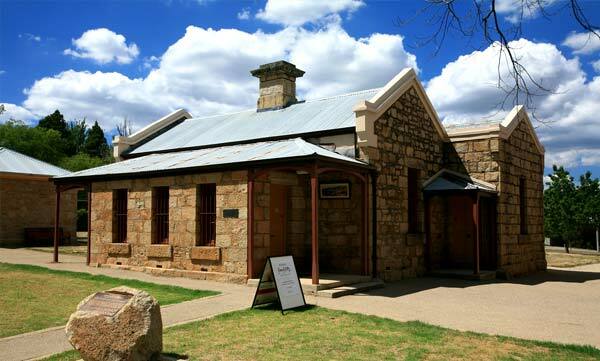 The Historic Precinct includes the old Beechworth courthouse, Burke Museum, telegraph station and treasury buildings. Visitors to the precinct can stand in the dock where Ned Kelly stood, visit the famous Ned Kelly vault museum or send a telegram to anywhere in the world from the telegraph station. Manager, Burke Museum and Cultural Heritage, Cameron Auty said Beechworth’s Historic Precinct and the Old Beechworth Gaol together form a unique part of Australia’s history. “The Old Beechworth Gaol is an important element of the fabric of the precinct, and our nomination will be strengthened by its inclusion. We look forward to working with the Old Beechworth Gaol to ensure these important historical sites are recognised at a national level,” said Mr Auty. The National Heritage List is Australia’s list of natural, historic and Indigenous places of outstanding significance to the nation. The Precinct buildings have already been registered by Heritage Victoria, the National Estate, the National Trust and the Indigo Shire Council planning scheme. Following Council’s decision, a nomination will be prepared and submitted in early 2019. An exhibition telling the story of Finch Street resident and World War One soldier, William Forrest, will open at the Beechworth’s Burke Museum this week. In 1915 at the age of 26, William joined the Australian Imperial Force. From the coastline of Egypt to the battlefields of Europe, he recorded his experience on his Kodak Box Brownie 2. The resulting images will be on display at the Burke Museum, alongside objects and diaries from the period. With the generous support of the Anzac Centenary Fund William’s War is a special photographic exhibition to commemorate the centenary of the armistice that ended the First World War. Burke Museum Collection Manager Linda Peacock said William’s War explores an important period in Australian history. “With his keen eye, William captured the destruction of the war as well as the beauty of the world as he travelled to Egypt, South Africa and the battlefields of Europe,” said Ms Peacock. William’s photos will be displayed alongside objects and diaries from the period. The exhibition will launch on Thursday 8 November, with an event at the Burke Museum from 5:30‐7pm. Curator Linda Peacock will speak alongside a representative of the Forrest family. William’s War will run until early 2019. Jaclyn Symes, MLC Northern Victoria, officially launches the start of the work on the $.6.2 million rail trail today near Lake Sambell in Beechworth. With Indigo Shire Mayor Cr Jenny O’Connor and CEO Trevor Ierino. The start of one of the biggest infrastructure developments in Indigo Shire was officially launched today by Jaclyn Symes, MLC Northern Victoria. The $6.2 million Beechworth to Yackandandah rail trail is part of the larger $12 million regional North East Victoria Cycling Optimisation project, funded primarily by the Victorian Government. Ms Symes officially launched the start of the trail work near Lake Sambell in Beechworth. The existing path, running from the end of the Murray to Mountains Rail Trail at Billson Street, through to Peach Drive, is being built up ready for sealing. Culverts have already been installed. Indigo Shire Mayor Cr Jenny O’Connor said the launch was a ‘momentous occasion’. “The $6.2m Beechworth to Yackandandah rail trail has been a long time in the planning, years in fact, and to have the official launch of this project today with the work that is happening along this section is truly a significant moment,” Cr O’Connor said. “The larger $12m project is a high impact tourism project that will create jobs and boost the regional economy through the growing number of visitors to the trail network. It is anticipated the project will bring more than 260,000 visitors to the region, opening up new business opportunities and creating jobs within local communities. Local businesses also stand to benefit from the project by getting involved in pop-up events and attractions along the trail. Cr O’Connor said better signage and viewing platforms along the route will entice people to visit things only discoverable by the trail. The new sections of the Beechworth to Yackandandah trail will take people past historic gold mining sites, aboriginal sites and beautiful scenery. Viewing platforms will be constructed to allow visitors to stop and experience the natural environment in a different way. The trail will also increase opportunities for visitors to enjoy the much-loved historic towns of Beechworth and Yackandandah and it will encourage the communities of Wooragee and Osbornes Flat and businesses along the trail such as wineries and farm gate businesses to take advantage of the increased tourist trade. “It will bring more visitors including families to our beautiful historic towns and natural environment in between. It will take up to three years to complete, but because it is being constructed in sections, parts of it will be available for use well before that 3 years is up,” Cr O’Connor said. A comprehensive branding and marketing campaign will be undertaken to increase awareness and I look forward with much excitement to seeing this project take shape. Stanley Athenaeum Volunteers Chris Dormer and Andrew Box, with Angela Henricksen and Archival Survival Award. Photography By Simon Fox, Deakin University. Staff and volunteers at two of Indigo Shire’s museums have been recognised at the 2018 Victorian Museum Awards last night. The Victorian Museum Awards celebrate the achievements of the Victorian museum and gallery sector. Linda Peacock, Collections Manager at The Robert O’Hara Burke Museum, received the Award for Excellence for her work involving people and communities. The Stanley Athenaeum received The Archival Survival Award for Volunteer-Run Museums for their Hearts of Gold – Minds of Mettle exhibition. The exhibition told the stories of 60 extraordinary nineteenth century Stanley women. Indigo Shire Mayor Councillor Jenny O'Connor said the awards recognise the passion and commitment that goes into running Indigo Shire’s museums and galleries. “Congratulations to Linda and the Friends of the Stanley Athenaeum for these prestigious awards. We are proud of the organisations and individuals who work hard to give us a glimpse into our region’s fascinating history,” Cr O’Connor said. “The Friends of the Stanley Athenaeum play an important role in developing the Athenaeum and its collection for both Stanley and the wider community. They were recognised for their work in uncovering the little known stories of Stanley's women of the 19th century with the Hearts of Gold – Minds of Mettle exhibition,” said Cr O’Connor. The Burke Museum is one of Australia’s oldest museums. It is home to significant collections from the 1800s, giving visitors a unique perspective on Beechworth’s place in Australian History. Originally a lending library, the Stanley Athenaeum now houses a collection of historic books, the Geoff Craig Local History collection and community archives that are available for reading and research. Indigo Shire Council tonight has backed a plan to reinvigorate tourism around the Ned Kelly story, boost visitors to Beechworth three-fold and inject more than $7 million into the local economy. Council voted to adopt recommendations made in Regional Development Victoria’s Ned Kelly Alive Report in relation to the Beechworth Courthouse and Historic Precinct, released earlier this month. The report recommends ways to enhance and expand Ned Kelly tourism in the North East – to leverage interest in this historic and controversial figure, and tell a bigger and bolder story about the bushranger and his life. Council voted to commit $500,000 to the Courthouse project over three years, a commitment aimed at leveraging potential State Government funding of $500,000. Mayor Jenny O’Connor said she welcomed the recommendations in the Ned Kelly Alive report. “The one relevant to Council is in relation to the Beechworth Historic Courthouse and plans to add to what we already offer there with an immersive digital interpretation of the Kelly Gang and family’s trials at the Courthouse,” Cr O’Connor said. “This initiative is designed to build on what our staff and volunteers already do so well. They tell our history in many different ways. This is a way of expanding on their efforts to tell the Ned Kelly story to a growing audience of multiple generations who respond to a variety of tourism experiences and have a passion for arts and culture. Under the recommendations, Beechworth Courthouse will be home to a high-quality immersive interpretation of the Kelly gang and family’s trials at the Beechworth Courthouse, inspired by the Trial of Joan of Arc in Rouen Cathedral in France. This would involve a mix of storytelling techniques including contemporary audio visuals, static displays, re-enactments, tours, and the historic fabric of the original buildings themselves. An application will be prepared by Tourism North East for investment from the State Government. Indigo Shire Mayor Cr Jenny O'Connor said she welcomed the Ned Kelly Alive Report released by Tourism North East and Regional Development Victoria. “It is exciting to see two concepts proposed for Beechworth; it recognises Beechworth’s existing Kelly credentials and collection as well as future tourism opportunities,” Cr O’Connor said. The Ned Kelly collection is made up of around 100 items, of which approximately 90 per cent are privately owned. It includes many rare items such as Sidney Nolan’s final painting Shot, Ned Kelly’s rifle, as well as original photographs and documents. Burke Museum Manager Cameron Auty said the owners of the collection in the Ned Kelly Vault have expressed a wish to expand the exhibition and experience. “We’re excited to tell the Kelly story in new and innovative ways, and revitalise the historic precinct with an immersive interpretation of the Kelly Gang and family’s trials at the Beechworth Courthouse,” Mr Auty said. The Ned Kelly Alive Report was funded by Regional Development Victoria, into the tourism potential of the life and times of Ned Kelly was released by commissioning partners, the Rural City of Wangaratta, Indigo Shire, Mansfield Shire and Benalla Rural City. This week, the Ned Kelly Vault in Beechworth’s Historic Precinct welcomed its 80,000th visitor. The Ned Kelly Vault opened in 2014, and is a unique partnership between Indigo Shire Council, the Burke Museum and a community of supporters. It is staffed by volunteers from the Beechworth area, with curatorial expertise provided by the Burke Museum. Burke Museum Manager Cameron Auty said Beechworth’s Ned Kelly Vault is one of the best places in Australia to learn about Ned Kelly. “The Vault houses regional Victoria’s most extensive collection of Ned Kelly artefacts and memorabilia, drawn from public and private collections across Australia,” he said. The success of the Ned Kelly Vault is a clear indication of the interest in the Kelly story from both Australian and international visitors. Ned, his gang and the police and people of North East Victoria are central figures in Australian folklore. Their tale showcases themes of crime, justice and injustice, immigration, the gold rush, the creation of creation of modern Australian identity. The Ned Kelly Vault is a great place to dive deep into these stories and more. Visitation at the Ned Kelly Vault is at an exciting time, with the Ned Kelly Alive report due to be released soon, Mr Auty said. “The report, by Tourism North East and Regional Development Victoria, in conjunction with local government authorities from the region, will showcase immersive and engaging cultural tourism experiences across Victoria’s High Country based on the Ned Kelly story. The Burke Museum in Beechworth is hosting a travelling exhibition from the Chinese Museum, titled 'Chinese Anzacs and Chinese Australians During the World Wars'. Glenna Thomson, author of Blueberry and Stella and Margie, will be visiting the libraries this month. This year’s Kerferd Oration is to be delivered by Northern Territory Senator Malarndirri McCarthy. Senator Malarndirri McCarthy is a Yanyuwa woman from the Gulf country in the Northern Territory. She first entered the public sphere as a journalist with the ABC and more recently for SBS/NITV. With a focus on bringing communities together and ensuring remote communities are engaged with and listened to, Senator McCarthy wants to encourage all Australians to be ‘bold and brave’ to develop a united vision for Australia. “First Nations people share a history that stretches more than 50,000 years. We have the longest surviving continuous culture in the world, yet our Constitution is silent on the existence of First Nations Peoples”, Senator McCarthy said. Senator McCarthy was elected to the Northern Territory Assembly as the Member for Arnhem in 2005. During her seven years in the Assembly, she held the Ministerial Portfolios of Local Government, Regional Development, Indigenous Development, Tourism, Women’s Policy and Statehood. She was elected as Senator for the Northern Territory in August 2016. Her experiences bring unique perspectives to the role of Labor Senator for the NT, a familiarity with the challenges and opportunities facing Territorians, and the perseverance and determination to drive change. The George Briscoe Kerferd Oration was first held in 2003 to commemorate the 150th anniversary of the naming of Beechworth. The annual Oration is a free community event sponsored by Indigo Shire Council, La Trobe University, WAW Credit Union and Quercus Beechworth. The Oration will be held at the George Kerferd Hotel, Mayday Hills, on Sunday 29 July starting at 11am - doors open at 10.15. The new IGA Ritchies supermarket in Beechworth will officially open for business at 8am on Wednesday 11 April. Ritchies CEO Fred Harrison said his team was getting quite excited about the official opening after more than two years of planning and construction work following the fire that destroyed most of the old store in January 2016. The new building will be officially opened jointly by Mr Harrison and Indigo Shire Deputy Mayor Cr Sophie Price. "The work to rebuild on the same site has been pretty constant of late and while there were some initial delays with cleaning up the site and finalising the plans, we are now all set to open the doors at 8am on Wednesday 11 April," Mr Harrison said. Since the fire, the supermarket set up business in the former plumbing shop building in Harper Avenue, Beechworth, with its liquor outlet 100m away in the former library building, owned by Indigo Shire Council, on the corner of Harper Avenue and Albert Road. Mr Harrison was full of praise for the previous occupants of the plumbing shop, Jo and Mick Westra, who moved to a site elsewhere in Beechworth in order to provide the community with a viable space for the temporary supermarket. "Indigo Shire Council has also been very helpful, leasing us the site where our liquor outlet now is and also throughout the planning and building phases of the new building," he said. "I also thank our staff who have worked so well in the temporary site and maintained our customer base. They are all looking forward to moving to the new building and we will also be increasing our casual and part-time staff numbers by 15, more over summer. "We have faith in our business, in our staff and especially in the people of Beechworth. They have continued to support us over the past two years and I thank them for that support. It means we can get off to a great fresh new start in the new building." Mr Harrison said the new premises would be light-filled, airy and spacious with a range of new offerings. A key feature is the latest development in environmentally friendly and energy efficient refrigeration, which is the first of its kind in Australia. Indigo Shire Mayor Cr Jenny O'Connor said it was great news to finally see the new supermarket about to open its doors. "The strength of community has been demonstrated again through this issue with people rallying to support the temporary IGA site and the staff there, knowing that something better and permanent was taking shape on the old site in Loch Street," she said. "I wish Ritchies and of course the current and new staff all the very best in their new building." Australia Day was celebrated across Indigo Shire on the 26 January with events in Barnawartha, Beechworth, Chiltern, Kiewa-Tangambalanga, Rutherglen and Yackandandah. Each venue featured entertainment, community meals and a flag ceremony, followed by the presentation of Indigo Shire Australia Day Awards. The awards celebrate the contribution of individuals, community organisations and businesses. They pay tribute to those who make extraordinary contributions to society or who are outstanding achievers in the Indigo community. We can all be proud of this year's award winners. Every community needs someone like Peter Croucher, everybody in the district knows and admires what Peter does. Peter gives his time to almost every aspect of our community life: sport, culture, education, the elderly, service clubs and fulfilling civic responsibilities. His involvement in and commitment to the towns of Kiewa and Tangambalanga add enormously to the quality of life of residents. Peter was an Indigo Shire Councillor for eight years, founded and co-edits the Kiewa River Gazette, he is a member of the Kiewa Tangambalanga Lions Club, the Tangambalanga Tennis Club, Kiewa Sandy Creek Football Club, bowling club, the Atauro Island Friendship Committee and past Junior Council coordinator. He has played music for 42 Deb Balls and was the secretary of the Kiewa District Tennis Association for 34 years. Peter has lived locally for almost all his life and has been a tireless worker for both his local community and beyond. Every Wednesday the Black Dog Soup Kitchen provides tasty and nutritious meals to those who need it. It is a social nexus that generates a true connection within the Chiltern community for people from different backgrounds. They also deliver meals to around 26 disabled and elderly residents who are unable to leave their homes to attend. The benefits are numerous -- healthy meals and a chance to have a conversation and catch up with old friends. The Tangambalanga-Kiewa Youth Action Crew was born out of the Indigo Shire Youth Action Crew Strategy to inspire, activate and train young people in the community to create and lead events and activities, and be the voice for young people in their community. The Youth Action Crew came together in June 2017 to organise and run their first community activation project, the Kiewa-Tangambalanga Mini Music Fest in November last year. The festival at the Kiewa Memorial Park included local artists such as Chelsea Knight from Staghorn Flat and the Tallangatta High Jazz Band, alongside established artists such as Twin Peaks from Canada and Aria award-winning artist Nicky Bomba and The All Stars. Community volunteer and mentor. Kathryn is a founding member of Plasticwise Beechworth and a member of Plasticwise Indigo. She was instrumental in bringing soft plastic collection to Beechworth. Kathryn has strong pride in her Chinese heritage and the history in the Beechworth area, and a passion to educate and share it with others. Tireless volunteer with the Rutherglen Lifesaving and Swimming Club, Rutherglen Neighbourhood Watch, Rutherglen Primary School and High School, Rutherglen Junior Football Club Glenview at Indigo North Health, Indigo Shire Community Grants Committee and St Stephen's Anglican Church. School, church and community friend. Rita is well known around the Murray Valley School for the disabled, the Barnawartha Primary School and Wodonga Secondary School. Rita is also a very fine cook! Dave spends many house maintaining the beauty of Yackandandah's streets. With his wife, Rose, other Yackandandah Garden Club members he is frequently seen weeding the garden beds, spreading mulch, and maintaining the planter barrels. Visitors and locals often remark on how the garden beds in the main street improve the town. Dave has been in the garden club for 10 years and was secretary of the Scouts for six years. Martin Miranda is a 16-year-old Soccer Player from Beechworth. Martin has dedicated a lot of time to his local club the Wodonga Diamonds and was selected to be part of the Seniors Team. Congratulations on your achievements, Martin! Beechworth has once again won the Victorian Overall Tidy Towns award for 2017, which was announced at an awards event in Horsham on Saturday night. Indigo Shire Mayor Cr Jenny O'Connor was full of praise for Beechworth and the manner in which it was showcased for the awards. "Beechworth has much to be proud of and it has been recognised, again, with this award. Beechworth won this award in 2014, and then twice in a row in 2009 and 2010, before going on to win the national award in Canberra in 2010," Cr O'Connor said. "Beechworth's involvement and the recognition our town has received over many years is testament to our wonderfully proactive and proud community members who both participate in the awards and organise our entries." Cr O'Connor acknowledged the hard work of the community group that compiled the town's application. "This group of people has an abundance of enthusiasm for the Tidy Towns Sustainable Communities Awards and every year they pull together our application," Cr O'Connor said. "Iris Mannik in particular deserves high praise. She has been a driving force in collating our entry for 24 years, ably helped by Ann Wilson for the past 14 years and also Jill Jarvis-Wills in recent years. "They never tire and their commitment to celebrating our town and community is to be applauded." Cr O'Connor said that since their inception in 1968, the awards had grown from being a simple anti-litter campaign to a nationally recognised program encouraging projects as varied as preserving heritage, saving water and energy, community action and leadership. "The long-term behavioural change across communities brought about by these awards allows us to build better communities year by year, and encourages us to tread lightly on our landscape." Beechworth will now go forward to the national awards early next year. 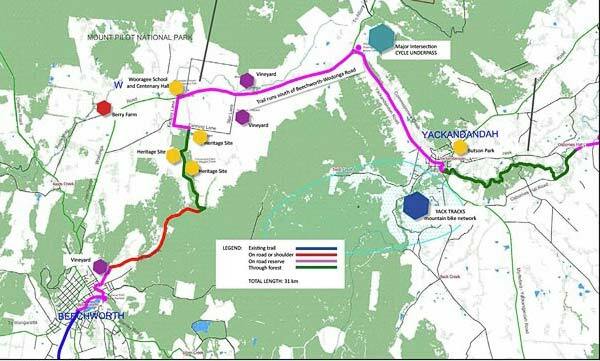 Indigo Shire Council will hold three drop-in information sessions about the new rail trail from Beechworth to Yackandandah and Osbornes Flat in the next few weeks. Funding for the North East Victoria Cycle Optimisation project, a $12 million regional rail trail project, was announced by the State Government in the May budget and was followed by a confirmation visit by the Premier Daniel Andrews to Yackandandah in July. The Beechworth to Yackandandah component will cost $6 million and is scheduled to begin early in 2018. Mayor Cr Jenny O'Connor said the drop-in information sessions would include a standing display of the maps of the route, handouts of maps and Frequently Asked Questions and other relevant information. "Staff will be available to answer any questions and we have timed the sessions for both afternoon and evening to allow people as wide a timeframe as possible to attend," Cr O'Conner said. "Beechworth and Yackandandah are much-loved and frequently visited historic towns that will be easily linked via the new rail trail. Both towns and the communities of Wooragee and Osbornes Flat and businesses along the trail such as wineries and farm gate businesses will benefit economically from increased tourist trade. "The new rail trail will be an asset that draws residents and tourists alike to enjoy its various attractions." Cr O'Connor said the trail alignment had been determined for many years based on availability of public land, connectivity of key nodes, suitable off-road alignment, and accessibility. Work is expected to begin in 2018, beginning with an underpass at the Wodonga Road-Yackandandah turn-off. "I encourage everyone to come along to one of the three sessions. Just drop-in, talk to staff, get some handouts to take home." Artist's impression of the new bridge. 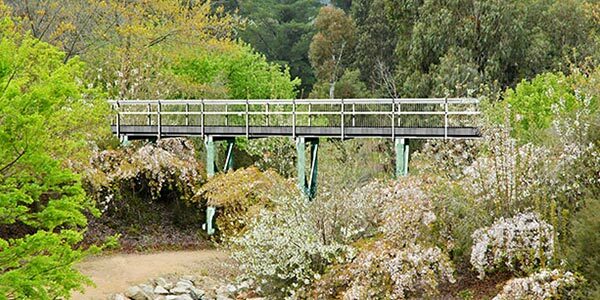 Indigo Shire Council will replace the pedestrian bridge on the Murray to Mountains Rail Trail near Albert Road in Beechworth. The existing structure, which overlooks the Chinese Gardens, was completed in January 2001 and modelled on the original railway timber trestle style structure which was dismantled in the 1950s and 1960s. The replacement bridge has been designed to sympathetically replicate the general character and appearance of the original bridge, enhance its safety and have a much longer life. The new design will use the existing timber supporting posts, add new steel substructure and handrails along with a dark-coloured reinforced concrete deck. The white handrails assembled with black steel fasteners echo the character of the original railway structure. Steel wires will infill the open area in these handrails to provide appropriate fall protection without detracting from the overall design. Heritage advice sought early in the project reinforced the fact that a fully accurate reconstruction of the original bridge would not satisfy the safety of all users with its low handrails and large gaps. The proposed design draws upon the character of the original bridge while using contemporary long-life steel and reinforced concrete. Photographs of the original bridges have been the key reference point for development of the new design. Detailed designs will be finalised this month and it is anticipated that contracts will be awarded in September ready for construction in the Spring. It is estimated that the bridge will be closed for up to eight weeks during construction with a short detour in place during this time.